CureIt is a simple app which gets you safe and natural cures to treat a variety of common ailments! 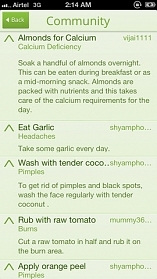 CureIt app has a huge collection of health tips and home remedies. 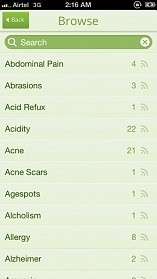 All the ailments and remedies are searchable, categorized and organized for easy access. All the information has been organized and cataloged, so you can relate the remedies to the proper ailments. 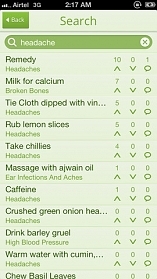 1.Browse the ailments list and get remedies from each of them. 2. 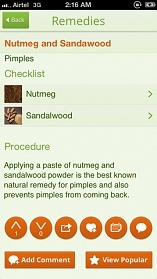 Find the list of herbs or spices used, instructions for each remedy along with previous user comments, likes and dislikes. 3. Search remedies by ailment name or keywords in the remedy description. 4. Organize your favorite remedies in My Favorites. 5. Checkout Community section to figure out what others do in CureIt App. 6. Like and Dislike remedies. 7. You can provide your suggestions, by Adding Comments to an remedy. 7. Share remedies with your friends. 8. 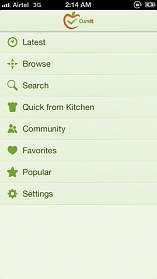 Quick from my Kitchen feature helps you to find out the matching remedies with the stuff you have in Kitchen.